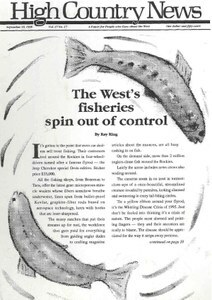 The story of whirling disease in Western trout is a story of human "improvement on nature" gone wrong. The writer seeks to change the sometimes-competitive relation between Easterners and Westerners into a true working partnership to save all American wildlands. The catalog-consumerism of trendy "Native American" items exploits both Indians and the non-Indians who want to dress and decorate for the part. A Native American journalist offers a fierce critique of Walt Disney's "Pocahontas." The Sierra Club's map of the Spokane-Coeur d'Alene watershed draws attention to the area's pollution and offers advice. Photojournalist Kit Miller explores the lives of Nevada's casino workers in photos and interviews in an exhibit called Inside the Glitter. "Caring for Creation" by Max Oelschlaeger, suggests using religious belief to fight ecocatastrophe. The Natural Resources Defense Council's report "Selling Our Heritage" blasts congressional plans to give away public lands. Keith Hammer's "A Road-ripper's Guide to the National Forests" offers advice on how to legally close and restore forest roads. Greater Yellowstone Predators: Ecology and Conservation in a Changing Landscape will be held at Yellowstone, Wyo. Writing the Lives of Southwestern Flora and Fauna will be held in Arizona. A new magazine called "Sheep Country" is intended for sheep growers in all 50 states. Challenging Federal Ownership and Management: Public Lands and Public Benefits will be held Oct. 11-13 at Boulder, Colo.
10th Annual Wild Rockies Rendezvous, Sept. 29-0ct.1, will be sponsored by the Alliance for the Wild Rockies. Cows poisoned; antler poaching; brucellosis logo in Yellowstone; overheated black-footed ferrets die; beef fudge recipe; prison near Norwood, Colo., school; salvage logging protest; "drive-through' Ph.D.; Harry Merlo's successor; recreation bulldozing. HCN anniversary in Lander, Rick and Heather Knight present award to HCN, new interns Heather Abel and Warren Cornwall. Colorado ranchers Demetrio and Olive Valdez want to begin selling local cattle as kosher beef. The Department of Agriculture investigates one of the nation's largest meatpackers, IBP Inc., for antitrust violations. Economist John Loomis puts a price tag on the value of tearing down two Elwha River dams and restoring the salmon runs on the river. The National Marine Fisheries Service proposes to list the coho as a threatened species in Oregon and California. A thunderstorm washes out streams and kills fish in Idaho's Boise and Crooked rivers. At an air summit meeting in Grand Junction, Colo., representatives at Denver International Airport hear a litany of complaints from Western Slope regional airport managers. Crown Butte mining company officials hastily file 38 claims on national forest lands adjacent to Yellowstone Park a day before President Clinton's moratorium on such claims goes into effect. Undaunted by a third federal court ruling against the University of Arizona's plan to build its large telescope on Mount Graham, Arizona Rep. Jim Kolbe drafts legislation to let the construction proceed. Montana Rep. Pat Williams wins a temporary moratorium on logging, mining and oil and gas leasing on 1.7 million acres of roadless area in Montana. Three male grizzlies are electrocuted by a downed power line in Yellowstone's Hayden Valley. Can sheep and coyote ever coexist? Predator Friendly, an unusual alliance of sheep ranchers, environmentalists and entrepreneurs, markets wool grown by ranchers who don't kill coyotes. A bill introduced in Congress would give the Park Service more power to regulate overflights. A lawsuit claims the Forest Service has been lax in obeying a judge's order to remove outfitter structures from Idaho's Frank Church/River of No Return Wilderness.